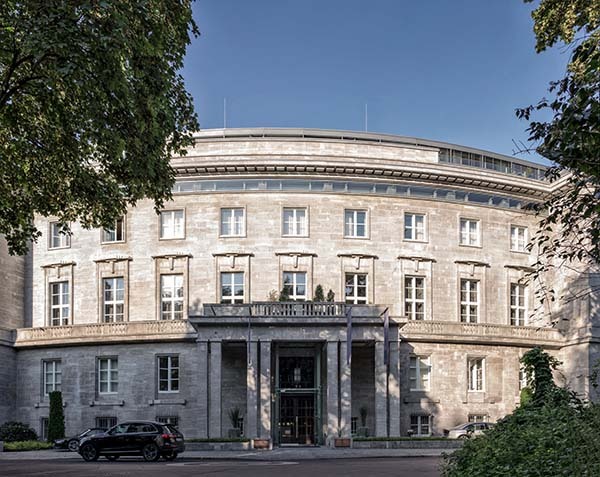 The exterior of Das Stue in Berlin‘s diplomatic quarter has such a sense of classical stately authority that it feels like a perfect film location—wartime generals pulling up outside in an extravagantly skirted Mercedes-Benz, marching inside with secret plans and diplomatic pouches to plot the next phase of operations. 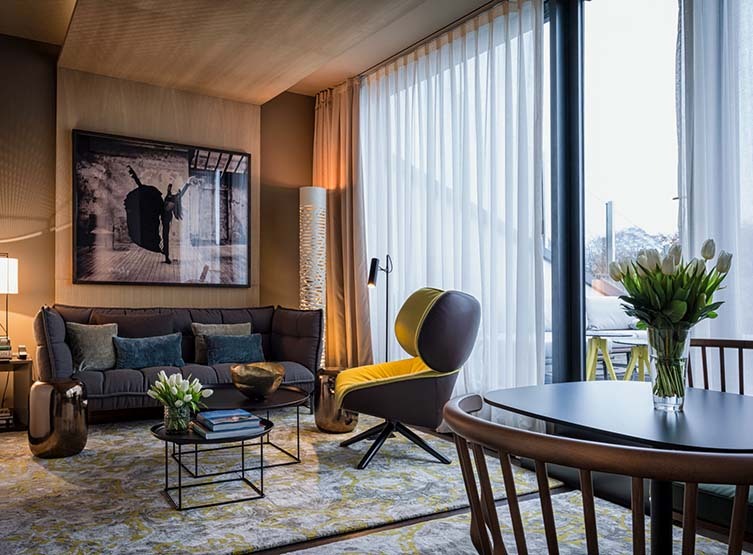 Built in the 1930s to a Johann Emil Schaudt design, Das Stue has been a staple of the Berlin hotel industry since opening in 2009 as one of the city’s first design hotels. A grand monument to the 20th Century adapted for the modern day, it sits in the very heart of Germany’s capital, taking pride of place between the Tiergarten park and Landwehr canal. Once, its building belonged to the Danish consulate. Now it welcomes guests from all around the world into tastefully decorated halls. 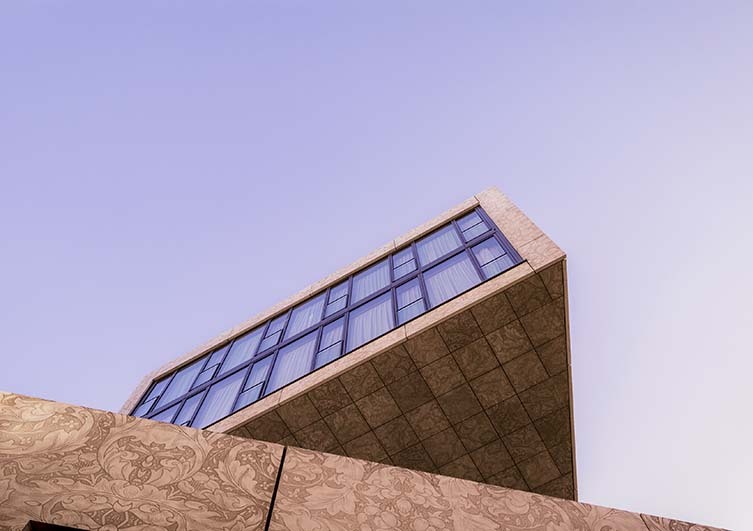 From its cinematic exteriors in, Das Stue is a hotel fit for a visiting film crew, or real-life dignitary, thanks to sympathetically realised public spaces by design-superstar Patricia Urquiola, modern room design by LVG Arquitectura S.L.P, and the addition of a new wing at the rear from Axthelm Architekten. 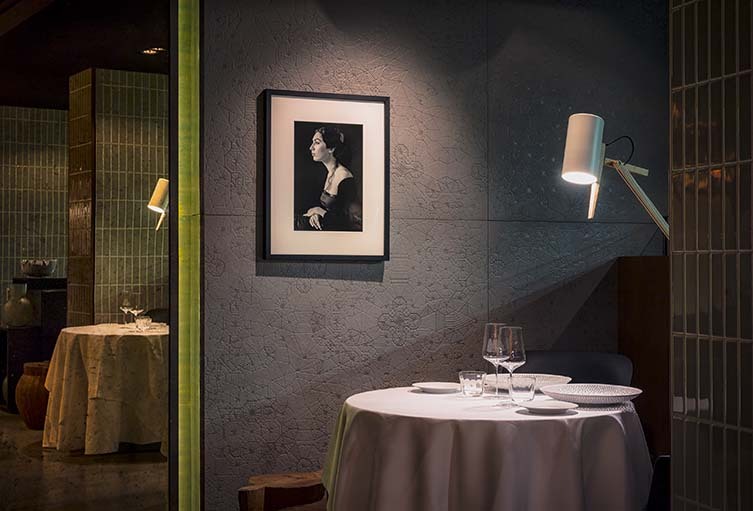 The interior has a level of luxury, both period and contemporary, that belies the stern-looking façade, and Das Stue continues to prove it is no slave to history with up-to-the-minute eco-friendly heating systems. 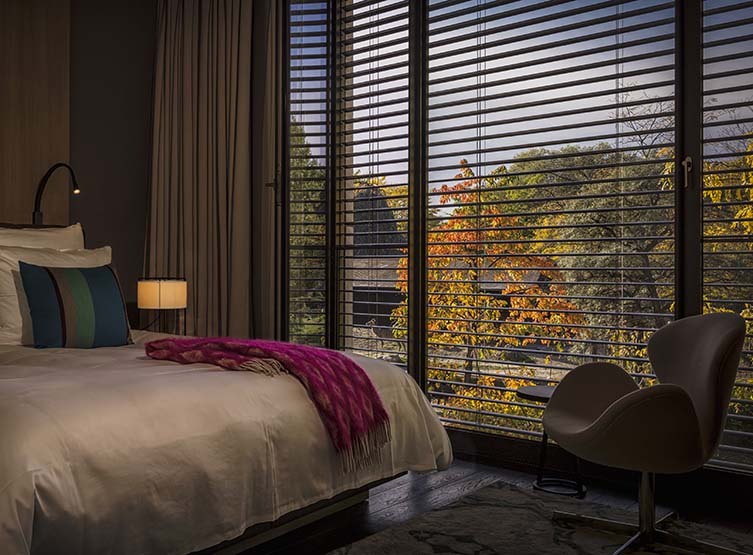 Das Stue’s 78 guest rooms have prices ranging from business standard to extravagant (justifiably so), with window views of neighbouring Tiergarten and the popular Berlin Zoo. Spacious and comfortable rooms on offer no matter the size of your purse or wallet, the rooms have a boutique feel despite the size of the hot. 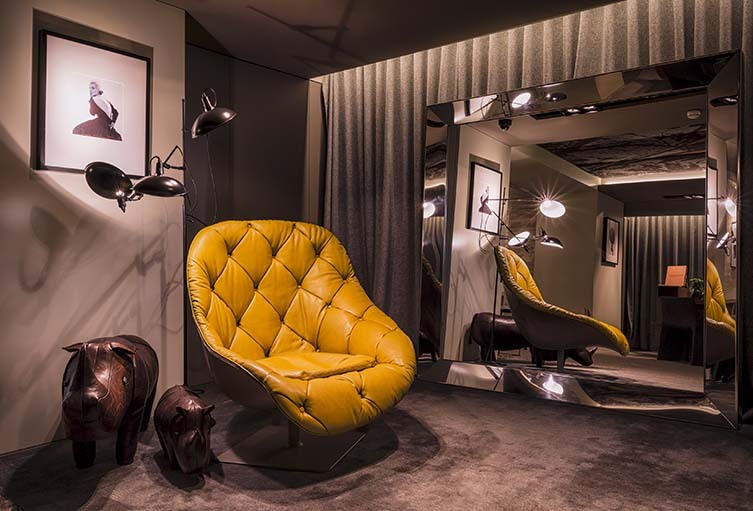 The staff at the hotel, its on-site spa, and in-house Michelin-starred restaurant, Cinco, are far and away a capable, friendly crew to boot—a medley of European languages between them, ensuring any and all stays are a pleasure. They’re quick to the mark and knowledgeable enough to solve any problem, whether you’re in simple need of a local map or emergency help following complications with your airline. Case in point: for the former, Das Stue has local tourist ‘Welcome Card’ bundles on offer. For the latter, staff can point you to a variety of online compensation and airline rights services such as Flightright, who outline that flight cancellation is subject to compensation under EU regulations if certain criteria are met and there are specialists on hand to help. The site Flightright offers a flight-look-up service that shows passengers how much they may be owed, for example. Should the worst happen, you can check your claim in two minutes flat. Between the Das Stue staff and outside help, even the direst of situations can be easily resolved. 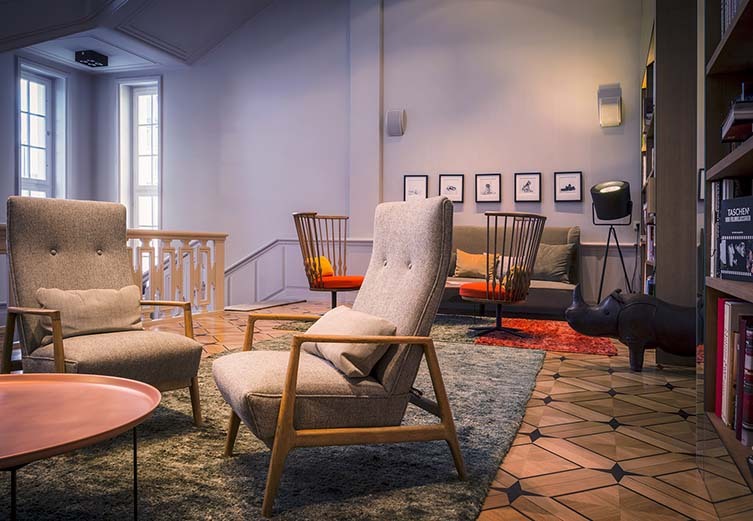 In short, the staff at Das Stue will do their best to minimise any problems you have and help you make the most of your stay. A breakfast buffet—filled pastries, fresh fruit, cold meats, and juice—is on offer for all guests each morning, with hot dishes from the kitchen available at extra expense. For lunch, both guests and visitors can order set menu pieces to be eaten either at the regular hotel bar or outside under canopy and sunshine, and for dinner, folks can choose between the same and the aforementioned Cinco, famous for its experimental tasting menus and wine selection. Room service is available 24/7, and personalised birthday or special occasion cakes are delivered upon request. 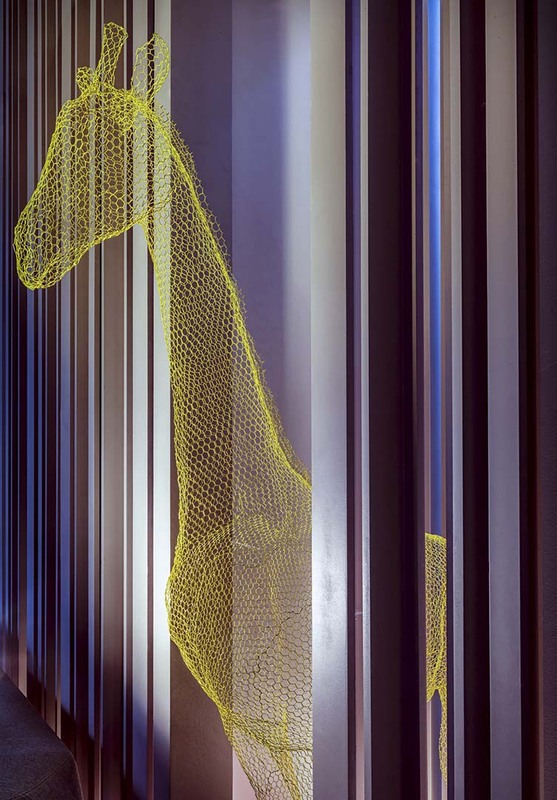 An exclusive ticket and gate system leads straight from the Das Stue garden to the grounds of the Berlin Zoo, meaning guests can stroll right in and out at their leisure. 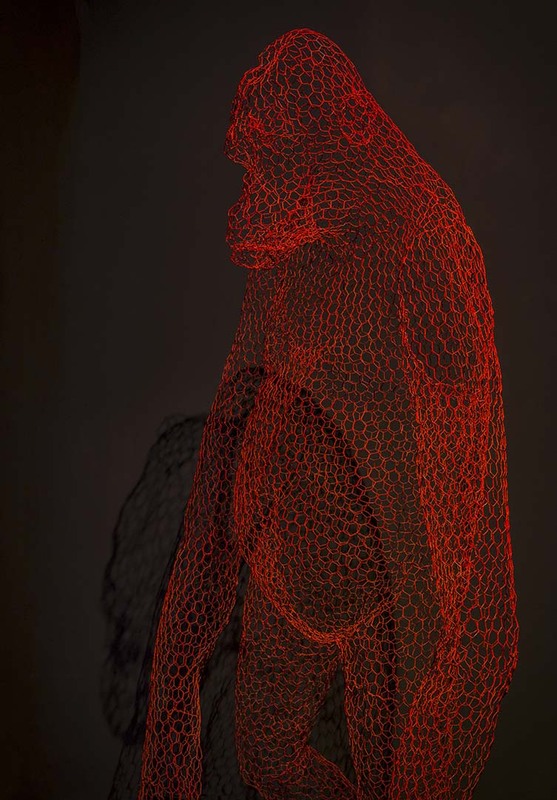 A bicycle rental system offers quick and easy access to the main city, either via the main road or through the forest paths of the Tiergarten, and Audi car rentals provide even wider access to the city at large. 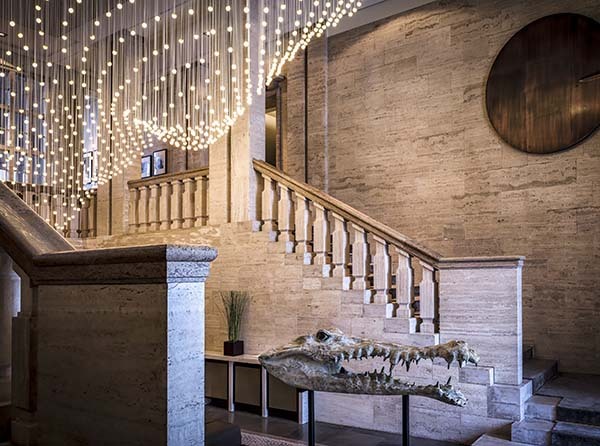 You’ll be hard-pressed to bring yourself to leave, however, Urquiola’s interior design and the hotel’s majesty—from its trapezoidal bar to the entrance hall crocodile skull—is certainly easy on the eye. 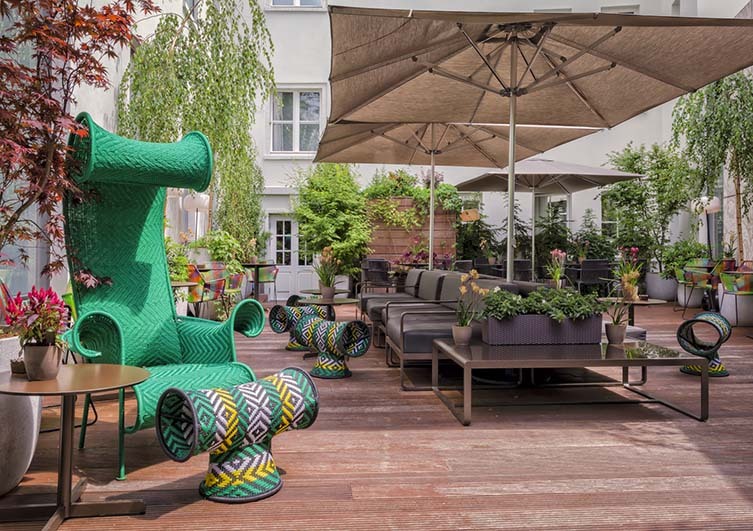 A famous hotbed of bleeding-edge creativity, it’s easy to forget Berlin can also do grandeur as well as the best of them, its museums, luxury retail, and sweeping boulevards often overlooked in favour of its hip galleries, peerless street art, and forward-thinking food and drink scene. 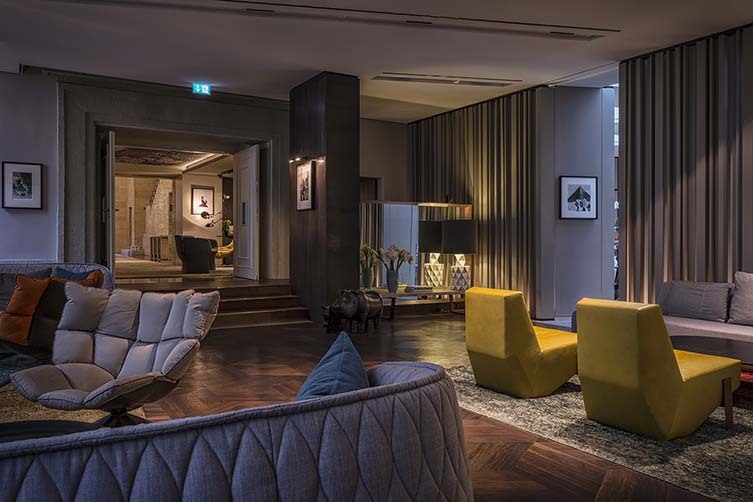 With its Tiergarten location and regal appearance, Das Stue is a reminder of the city’s stateliness and style, and a fine place from which to explore the other side of the German capital. Wunderbar.